Let's face it - you were ready to replace the exhaust system on your dirt bike the minute you brought it home. It's one of the most common upgrades and if you're looking for the best full system or slip-on for your dirt bike you've found the right place. MotoSport stocks a surplus of 2-stroke and 4-stroke exhaust systems for your dirt bike. You'll find only the most respected industry brands that offer budget friendly upgrades to what the pros ride. The benefit to upgrading the exhaust is two-fold. First, you'll feel the increase in power. That's thanks to the horsepower. Or is it because it's lighter than stock? Because that's the second benefit. Finally, that sound. 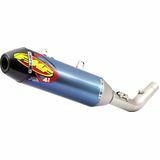 It's a sight and sound of beauty with the only difficulty to upgrading your dirt bike's exhaust is which one to choose. Don't worry, we're here to help. Our Gearheads know exhaust systems inside and out and we can recommend the best slip-on or full system based on the make and model of your dirt bike and where you ride. 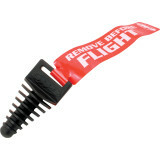 We also stock the exhaust accessories needed to keep your new system working like packing, pipe guards and plugs. Call us if you need help at 888-676-8853 or use the Live Chat to start a conversation. We are The Guys That Ride so any dirt bike exhaust related question you have, we can answer it. We ship our exhaust systems fast and orders more than $79 qualify for free shipping.